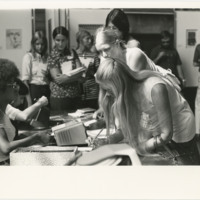 Female students are registering for fall courses in the Thomas Reading Room (now Thomas Great Hall). Two men are in background, to the right. 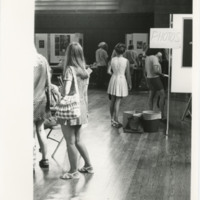 Students are registering for fall semester in the Thomas Reading Room (now Thomas Great Hall), sign reading 'Photos' in background, to right. 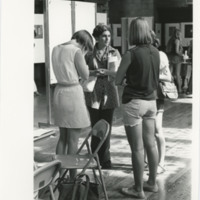 Group of four female students during registration in the Thomas Reading Room (now Thomas Great Hall), standing in an inwardfacing square, one has head in her hands. 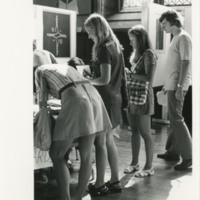 Students waiting in line to sign forms at a table in the Thomas Reading Room (now Thomas Great Hall) during fall registration, men visible in background by a different table. 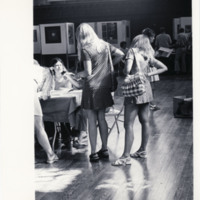 Students waiting in line to sign forms at a table in the Thomas Reading Room (now Thomas Great Hall) during fall registration, other students visible in background by a different table. 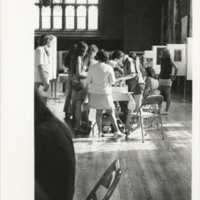 Students waiting in line in the Thomas Reading Room (now Thomas Great Hall) during fall registration.